Often times, employees tend to perceive the staff that works on information technologies and systems as a “computer guy”, a “web guy” or a “techie”. This perception shows a lack of understanding of current organizational developments and frameworks and, more importantly, is a reflection of how they handle these matters within whatever organization they work (public or private, large or small, for-profit or not). Consequently, this perception is a reflection of how a modern organization is understood (not very well) and how it is run (most likely, poorly). A Chief Information Officer (CIO) and an IT Manager are not the same. Of course, in medium or small size organizations you might find a single individual playing both the CIO and the IT Manager role and understanding very well the differences between each position. Unfortunately, it is not enough for the person filling this role to know what each role entails. What really matters is how the CEO and other senior staff members perceive this person, if they know which “hat” she or he is wearing at any particular moment and, most important, if her or his comments and contributions are part of the strategic decisions being taken by the organization. When playing the CIO role, either full or part time, the focus should be on how information technologies and systems can help the business strategy and to make sure that there is alignment with that strategy. The IT manager, on the other hand, should make sure that all systems are up and running properly and that the different IT staff members are doing what they are supposed to. It is true that you cannot be an admiral without a fleet and if you are just managing a handful of Help Desk guys you are not a CIO. CIO is a leadership position and an IT manager is a managerial position. As we have seen in multiple business books, leaders inspire while managers measure; leaders guide and managers navigate; leaders envision and managers maintain; leaders talk and managers listen; leaders support and managers teach; leaders hope and managers direct; leaders expect and managers demand, etc. Obviously, success requires both. If your business card says CIO but you do not sit at the senior staff meetings with CEO, CFO, Vice-Presidents, etc. you are not a real CIO. Obviously, organization size, type of business, etc. are key factors, but by no means are they founded excuses to not allow the CIO to sit in the key strategic meetings. A real CIO is supposed to take a strategic view of the organization, understand the business requirements and facilitate interaction with the other departments. He will have to set the agenda for strategic projects and technologies. For this agenda to work, the IT managers have to make sure that the basic and support technologies are running smoothly. Organizations that do not have anyone performing CIO activities, even if it is just part time, show a lack of vision and a lack of understanding about the role that information technologies and systems can play today. Information technologies and systems have the capacity to transform the way organizations do business. They are not just solution providers but, even more important, they are enablers. They solve problems but also create value. Published at the front cover of Infonomia on May 8-11, 2009. By now we all know that Google is no longer (if it ever was) a search-engine related company. Obviously it is much more than that and is trying to be part of all aspects of our lives. We have enjoyed, for a while now, services like web search engine, email, word processor, spreadsheet, library, news provider, etc. Back in November 2008 I wrote about how Google is using the information gathered to provide innovation services such as real-time information about the spread of Flu infections. As we know Google doesn’t stop and continues innovating on all kinds of fronts. Here is another example. Back in the Fall of 2008, Google teamed up with General Electric (GE) to assist building what they called the Smart Grid. This will provide two-way communications, using the power grid, between customers and suppliers. This may not sound like anything new. In fact, though, the interesting thing about this is the new approach. Google’s approach goes one step further by trying to take advantage of the flows of information that can occur. For example, utilities can better monitor electrical usage while users can obtain more accurate and faster (even real-time) information about their own electrical usage. What lies behind all of this is even bigger and is an attempt, by both Google and GE, to push for policy efforts that facilitate and enable the availability of renewable energy generation in the United States. With a SmartGrid like the one proposed, we should be able to manage better our home energy use in order to reduce costs. Later on, and if the whole green technology movement catches up, we should be able to power our electrical cars when energy costs are lowest based on real-time consumption data (see RechargeIT Google initiative) or even sell to the grid the excess power we generate at home, for example through solar panels, wind, etc. Some skeptics think that this will never happen or is many years away. Despite their arguments, I believe that when companies such as Google and GE make this kind of agreement (and back them up with resources in terms of minds and money) we should expect some results. Let’s see what happens! Published at Infonomia the week of February 23, 2009. 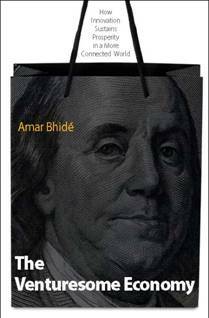 I just finished reading “The Venturesome Economy”, a new book by Columbia Business School Professor Amar Bhidé that I highly recommend. The book focuses on the sources of innovation and why some innovations receive funds from venture capital companies while others do not. The answer seems obvious but, according to Bhidé, it is not. His research leads him to suggest that successful innovation is unrelated to the creation of new solutions but depends instead on inventing new applications for existing solutions. Over the last few years many articles and lectures, especially by the CEOs of large corporations, have expressed concern about the United States losing its leadership position in innovation against emerging economies, especially India, China and even Brazil. Part of the argument is the lost battle about the so-called hard sciences (Mathematics, Physics, Computer Science, Engineering, etc.) not interesting as many students as they used to. While this is happening in the U.S., emerging economies have focused on ensuring that their most talented students receive the best possible science education. Paradoxically, many of them go to the United States where the percentage of foreign Ph.D students has been growing for the last few years. 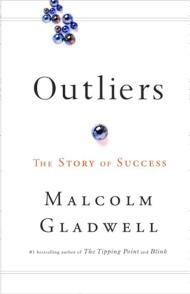 Malcolm Gladwell, in his latest book “Outliers”, mentions that Asian students perform much better in Mathematics, Physics, etc. than the rest simply because they work much harder. Many people in the U.S. fear that this will allow these countries to overtake the U.S. in innovation and consequently the emerging market economies will become much stronger and even superior to the U.S. economy. Professor Bhidé argues that hard work and innovation per-se is not enough. His main argument is based on the idea that U.S. companies are much more sophisticated when it comes to marketing, distribution, sales and customer service. He claims that these are the factors that provide the advantage over the rivals. We all remember the typical examples such as Betamax being better than VHS or HD-DVD being better than Blue-Ray. These technologies did not succeed despite their technical superiority. All the other factors (marketing, distribution, etc.) ended up being more relevant. Bhidé insists that for the U.S. to keep its advantage as an economic power, there is a need for more and better MBAs, not more Ph.Ds. I believe there are enough arguments on either side to merit more research and debate in the area of innovation, both on technical and business aspects. Published at Infonomia the week of December 9, 2008. Como muchos, siempre estoy tratando de encontrar la herramienta perfecta que me permita capturar y tener al alcance de la mano la información que necesito y cuando la necesito (páginas web, grabaciones de audio, fotografias, texto, etc.). Lo más cercano que he visto a esta realidad se llama Evernote. Evernote permite capturar información desde cualquier entorno y utilizando, básicamente, cualquier plataforma. Además permite que esta información este accesible e indexada (incluyendo reconocimiento óptico de caracteres) desde cualquier lugar. Soy usuario de Evernote desde hace sólo unos días y la verdad es que es una herramienta excelente (los más de 520,000 usuarios registrados también lo avalan). La herramienta está disponible para Windows, Mac pero también como plug-in para Firefox así como una excelentísima aplicación para iPhone así como para otras plataformas móviles. La información, independientemente de la plataforma utilizada, se está sincronizando constantemente por lo que si utilizas varios ordenadores y el teléfono móvil (muy común en nuestro días) siempre tienes la misma información en cualquiera de ellos. Ademas, por ejemplo, permite tomar fotografías con la cámara del teléfono móvil o en el ordernador y prácticar a posteriori un reconocimiento de caracteres (en el servidor) que permite hacer búsquedas. Un ejemplo de esto que yo utilizo es el de las tarjetas de visita y los libros: con mi iPhone tomo fotografías de tarjetas de visita que me dan o de portadas de libros que me interesan. En el servidor de Evernote, además de sincronizar las fotografías en todas mis plataformas, hacen un reconocimiento de caracteres por lo que si hago una búsqueda de parte del texto de la tarjeta o del libro me aparece la referencia y la imagen) de forma instantánea. Además, si lo deseas, puedes compartir con el resto del mundo aquellas notas (clasificadas por cuadernos) que desees. El software y la utilización de todo el servicio es gratuito con unos límites de vólumen que son más que suficientes para el usuario normal. Si eres un usuario que maneja enormes cantidades de datos y notas puedes optar por la versión de pago (que sólo cuesta $5 dólares al mes o $45 al año). Los usuarios de iPhone son incluso los más beneficiados de este servicio ya que la aplicación específica para éste es excelente. La aplicación de iPhone la utilizan el 57% de los usuarios de Evernote, seguida por el web (51%), la aplicación para PCs (32%) y la de los Macs (28%) aunque, como yo, muchos usuarios acceden al servicio desde más de una plataforma. Por mucho que trate de explicar esta aplicación/servicio aquí no le estoy haciendo justicia por lo que lo más recomendable es que visites su website y lo pruebes por tí mismo. A continuación hay un par de videos que te pueden ayudar un poco más a conocer Evernote. In the November 24, 2008 issue of Fortune magazine there is an article that briefly explains what Research In Motion (RIM), maker of the Blackberries, is trying to do to maintain its current dominance in the smart phone market in the US (Up to July 2008 its market share was 50% and it was the same for 2007). Their latest, and most advanced model, Storm, went on sale this week in the US through Verizon Wireless. This model has pretty much every feature that you can imagine (GPS, Media Player, Browser, Camera and Video Recording, Voice Activated Dialing (VAD), Multi Band, etc.) but one of the strongest selling points is a “feeling” on-screen keyboard. They call it SurePress Touch Screen, which is a subtle click that lets you know the letter has been entered. In the Fortune article they also mention that a big feature, compared to the Apple iPhone, is that the Blackberry Storm has a removable battery. It is also mentioned that, immediately after the creation of a $100 million fund for iPhone applications, the Blackberry Partners Fund was launched with $150 million to spur new software development for Blackberries. If a new kind of on-screen keyboard, a removable battery and $50 million more on venture funds is the strategy to maintain RIM market share and to cope with the iPhone and others (mostly Android-based T-Mobile G1 and unlocked Nokia E71) I honestly believe they don’t get it. Although, from a practical point of view, a removable battery would be a nice feature for the iPhone I look at it differently and as follows: if the battery is going to last me for two or three years it is quite likely that, by then, I would have already upgraded myself to whatever new iPhone or other smart phone is available at that time. I do not have any figures but it is my guess that many, if not most, of the hundreds of iPhone applications already available have not benefited from the $100 million venture capital fund created for that purpose. I believe it will be the same for the Blackberry one if indeed they are able to attract developers to the platform. You will not find here a criticism for the Blackberries. I have been a user, a happy one, for many years and it has always been a great tool for me. It was the company that I work for who got me an iPhone (they decided to get rid of blackberries and moved to iPhone but it was becasue of an issue with carriers and prices rather than devices themselves). 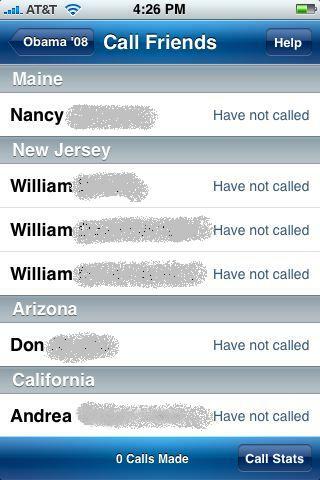 It is certain that, up to now, the iPhone is not as efficient for me when sending email messages as any of the multiple blackberries I have had in the past. But, yes, but all the other things I am getting from the iPhone such as a nice and smooth web browsing experience, hundreds of, mostly not useful, applications that I enjoy testing, my music and pod casts, my pictures, games, etc. are much better than the, so far, unsuccessful attempts Blackberry has made. Yes, the latest blackberries have many, if not all the features, that the iPhone provides but they are not as smooth and nicely integrated. I am not, and do not pretend, to be an expert on Marketing or Design but there is no doubt that Apple knows how to do and market nice products. They also provide them with additional factors that make them attractive. Factors such as coolness (as an expression of admiration and approval), slim design, easiness of use (as low or null level of difficulty. No training or manual needed), smooth integration with desktop software, etc. 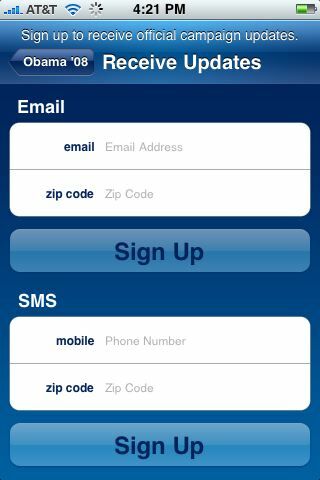 Apple has already attracted many of the non-corporate users (made the smart phone market bigger) and now is trying hard with the corporate customers (gaining market share from RIM) by providing E-mail, address book and calendar integration with Exchange, corporate IT Management and Virtual Private Network (VPN) capabilities. 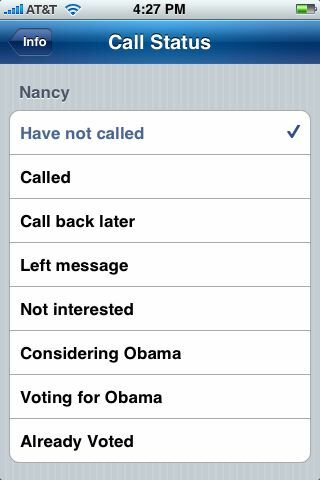 Despite I believe that Blackberry email capabilities are still superior to those of the iPhone the rest are not. 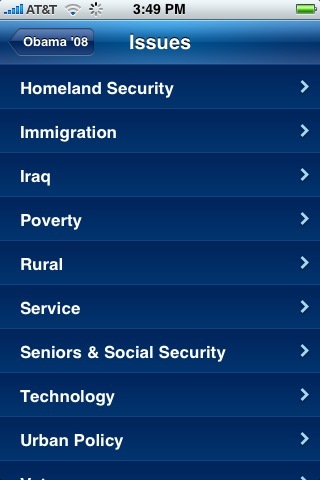 Software applications and media handling (music, movies and pictures) are far better on the iPhone than on Blackberries. My guess is that iPhone market share will continue to grow. Let’s revisit in a year to find out where things stand. Sería interesante poder saber el número diario de nuevos enfermos de gripe, también sería muy interesante poder saber en qué ciudades y hacía dónde se va expandiendo cada día. Esta información, hasta ahora, le costaba al Centro de Control y Prevención de Enfermedades (CDC, siglas en inglés para el Centers for Disease Control and Prevention) de los Estados Unidos no sólamente mucho dinero sino además el hecho de que la información no era inmediata. Siempre se iba con unos días de retraso. La información es recogida en los miles de centros sanitarios, agregada periódicamente y entonces enviada a Atlanta, sede del CDC, donde aún hay que realizar trabajos de análisis y evaluación de datos. Google (si, otra vez ellos) está proporcionando toda esta información y una nueva forma de seguir la expansión de la gripe en los Estados Unidos. Además permite hacerlo de forma instantánea. Google Flu Trends analiza las búsquedas que las personas hacen de temas relacionados con la gripe y localiza la posición geográfica de estas búsquedas en un mapa. Esta ya demostrado que en lugares donde el acceso a Internet está muy extendido existe una gran correlación entre los casos de gripe y las búsquedas en Google acerca de temas relacionados con la misma. Si bien el modelo no es perfecto podemos ver en el gráfico anexo que la información proporcionada es de muchísima calidad. La doctora Lyn Finelli (Jefa de Seguimiento de la Gripe para el Centro de Control y Prevención de Enfermedades) afirma que “[…] la información que nos está llegando es prácticamente en tiempo real. Nos proporciona, día por día, toda la información relativa a la gripe para un área determinada”. Del mismo modo afirma “El año pasado, cuando validamos este modelo, nos permitió predecir los casos, ubicación y tendencias de la gripe con una semana de antelación. Esto puede ser utilizado como una herramienta de aviso y control, en este caso para la gripe”. Esta información puede ayudar a que los hospitales y centros de salud se preparen con antelación y tomar medidas en caso de una posible pandemia. El acceso a esta herramienta es gratis y Google afirma que sólo se proporciona información agregada mientras que los datos individuales se mantienen de forma confidencial. Una vez más hablamos de innovación, innovación en los usos de información que ya existe. Gracias al comportamiento de las personas la tecnología nos permite obtener información muy últil para la sociedad. Obviamente, el debate acerca de la privacidad, de Google como Gran Hermano, etc. continúa y no pretendo entrar en él ahora, pero el hecho de que esta información es tremendamente útil no es cuestionable. Innovar, entre otras cosas, es encontrar usos nuevos a cosas que ya tenemos, proporcionando un valor añadido que pasaba desapercibido. El uso de la información para analizar comportamientos está muy estudiado y el llamado data mining se ha convertido en toda una industria, dedicada a saber más de nuestro hábitos de consumo y comportamiento pero con el fin de vendernos más cosas. Si conseguimos que, además, haga aportaciones positivas como la mencionada, vamos mejorando en tono positivo. Publicado en Infonomia la semana del 24 de Noviembre de 2008. Cuando hablamos de innovación ya todo el mundo asume que no quiere decir nuevas tecnologías, ni investigación y desarrollo, ni brain storming, ni nuevos productos, etc. Ya todos sabemos que hay varios tipos de innovación, desde la puramente basada en la eficiencia a la más revolucionaria. De igual forma los términos Web 2.0, redes sociales, el ordenador virtual basado en el cloud son también muy usados (y abusados) estos días. En este breve artículo me quiero centrar en como la campaña de Obama ha sido innovadora sin inventar ni revolucionar nada. Si bien es cierto que no es la primera campaña política que utiliza tecnologías de información en general e Internet y sus posibilidades en particular, si que podemos afirmar que la campaña de Barack Obama ha sido la más efectiva haciendo uso de la mismas. No ha sido la más efectiva desde el punto de vista innovador porque haya ganado las elecciones ni porque haya conseguido recaudar millones de dólares sino porque ha sabido utilizar las posibilidades de Internet para difundir su mensaje con rigor y llegar al público adecuado. 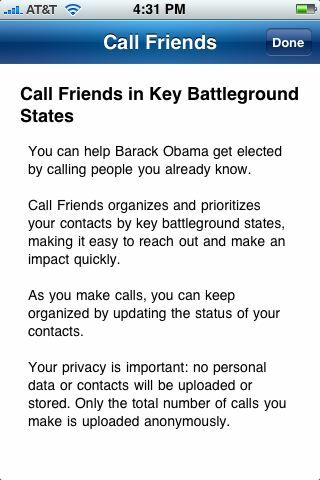 No me considero, ni pretendo, ser un experto en campañas políticas pero en mi caso puedo afirmar que la aplicación para iPhone que la campaña de Barack Obama creó y puso de forma gratuita a disposición de todos los usuarios me ha sido muy útil no sólo para estar informado sino también para ayudar de forma efectiva y, modestamente, contribuir a la misma. A continuación se presentan una serie de pantallas de la aplicación y sus descripciones. Al final y para concluir con lo importante se presentas mis argumentos de porque esto es innovador y como las empresas y organizacione de todo tipo se pueden beneficiar. La primera opción, la de “Llamar a los amigos” (Call Friends) organiza el directorio de contactos que uno tiene en el iPhone por estados y permite tener seguimiento de las llamadas que has hecho a estos amigos para sugerirles primero que voten, y segundo que voten a Obama. 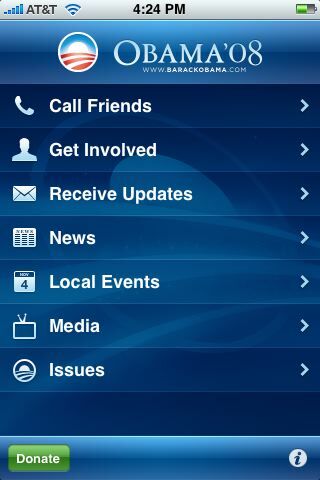 Como se ve en la pantalla siguiente, la aplicación permite asignar a cada llamada (contacto) su correspondiente “status” (dejé mensaje, no está interesado, votará por Obama, etc.). El programa sólo notifica a la campaña de Obama del número de llamadas realizadas. Ninguna información es transmitida a la campaña. 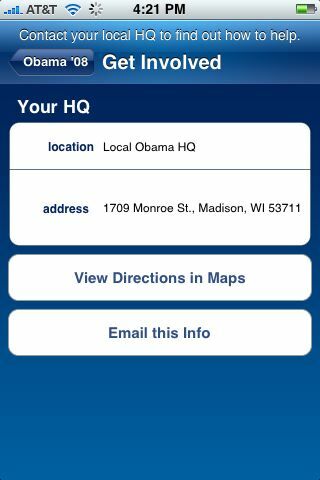 La opción de “Involucrate” (Get Involved) permite, si uno lo desea, utilizar el GPS incluido en los iPhone 3G, o simplemente teclear el código postal para que te indique cuál es la oficina de la campaña de Obama más cercana. 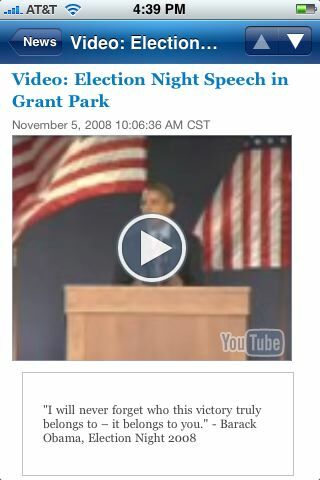 La campaña de Obama ha hecho un uso muy efectivo del correo electrónico así como de los mensajes SMS para tener a sus seguidores informados constantemente. 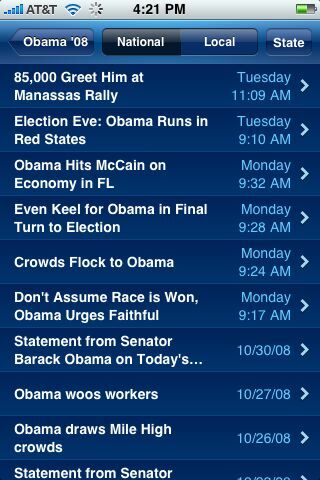 La aplicación Obama ’08 permite susbscribirse desde el teléfono para recibir estos mensajes. La cuarta opción, “Noticias” (News) permite saber constantemente todo lo que esta pasando relativo a la campaña, clasificado a nivel Nacional y a nivel Local. Otra opción disponible es la de facilitar a los usuarios como los diferentes medios de comunicación presentan la campaña. Para ello se ponen a disposición de los usuarios desde videos, grabaciones de programas radiofónicos, entrevistas, etc. El tema mas interesante para mí es el del programa y asuntos políticos (“Issues”). Todos los temas importantes están representados y para cada uno de ellos se presenta el problema actual y cuales son las soluciones que se proponen por parte de Obama. Esta forma de presentar la información permite estar informado, sin sesgo de las posiciones de Obama, de sus planes y acceder a los mismos desde cualquier lugar. Si miramos las diferentes opciones incluidas en la aplicacion no hay nada que destaque por ser nuevo desde el punto de vista tecnológico (email, SMS, páginas web, etc.). Lo innovador no es la tecnología en sí misma sino el juntar todas estas opciones en una sola aplicación, así como el uso de la misma. Desde el punto de vista tecnológico el riesgo es minímo ya que todo lo que se usa está más que probado. El uso de estas tecnologías coincide con el mensaje de la campaña. Cuestiones tales como cambio, renovación, no más de los mismo, involucración, clase media, juventud, igualdad, oportunidades para todos, etc. son complementarios y coherentes con este uso de las tecnologías. Como dice Alfons Cornella (www.infonomia.com) “La revolución está en manos de gente normal que hace cosas extraordinarias“. Coincide en el enfoque de los llamados movimientos de base (grass roots) en los que la acción viene de abajo haci arriba y con sentido común, sin grandes pretensiones pero con mucho conocimiento de que es lo adecudado hacer. Este tipo de actuaciones representan una innovación que siempre ha existido pero en tiempos de crisis como el actual, soluciones e ideas basadas en el sentido común y en el uso no tradicional de lo ya existente tiene mucho futuro. Estoy de acuerdo con la reflexión de Alfons Cornella acerca de la necesidad de reinventar las escuelas de negocios. Prueba de ello es mi propia experiencia profesional de los últimos diez años. Vivo en Estados Unidos desde 1998 y mi experiencia aquí, durante ocho años como Director de Sistemas de Información (Chief Information Officer) para una compañía internacional de consultoría en Washington, DC (www.casals.com) y ahora como gerente (manager) para otra compañía consultora en tecnologías con base en Chicago (www.whittmanhart.com) coincide con lo que Cornella menciona (” […] No es posible hablar de negocios sin hablar de tecnología”). Por esa misma razón mi trabajo ha sido el de facilitador o traductor. Mucha gente no entiende lo que hago porque parte de mi trabajo consiste en traducir lo que los gerentes y managers de las organizaciones quieren o desean, en requerimientos para los programadores, gestores de bases de datos, etc. Los gerentes y managers de las organizaciones saben lo que quieren pero no entienden mucho de tecnología mientras que lo ingenieros, programadores, etc.. entienden de tecnología pero, en general, les cuesta mucho mas ver la visión global del negocio y con frecuencia se quedan en los aspectos puramente tecnológicos. Esa necesidad de saber lo que una idea para un nuevo producto o un nuevo servicio implica en términos tecnológicos (servidores de web, bases de datos, usabilidad, etc.) no está, todavía, incorporada en la escuelas de negocios. Es por ello que las nuevas grandes empresas que utilizan la tecnología como principal fuente de negocio, para generar productor o servicios, son en mucho casos el fruto de jóvenes empresarios (ejemplos típicos son Google, Facebook, Digg, etc.) que por pertenecer a la generación que pertenecen han tenido un contacto con las tecnologías de información desde muy jóvenes y han crecido con ellas. Por motivos profesionales he tenido la oportunidad de participar en reuniones con gestores de fondos de capital riesgo (venture capital) y la primera pregunta después de explicar el producto o servicio es: ¿Cuál es el modelo de negocio? La intención es saber, independientemente de que el producto o servicio pueda ser mejor o peor, ¿Cómo se va producir el retorno de la inversión? En muchas ocasiones grandes ideas de productor o servicios no han visto la luz porque no se ha sabido responder a esa pregunta. Exactamente ese es el espacio que todavía las escuelas de negocios tienen que cubrir. El modelo tradicional de enseñar cursos de Marketing, Finanzas, Estrategia, Gestión de Proyectos, etc. como compartimentos estancos es obsoleto. No estoy diciendo que estas disciplinas no sean importantes sino que, hoy por hoy, todas esas disciplinas están interrelacionadas y como tal se han de impartir en las escuelas de negocios. No es posible tomar decisiones empresariales mirando solo cada una de estas disciplinas sino que las decisiones han de tener en cuenta, como mínimo, todos esos componentes. Las escuelas de negocios y sus profesionales han de trabajar hacia un modelo donde las diferentes disciplinas se interrelacionen y los alumnos puedan analizar, de forma conjunta, el impacto global de esa interrelación. Es mas fácil decirlo que hacerlo, especialmente porque las escuelas de negocios están todavía organizadas en base a los departamentos tradicionales de Marketing, Finanzas, Métodos Cuantitativos, etc. La colaboración entre departamentos se ha de incrementar y nuevos cursos, con contenidos y profesores multidisciplinares, han de aparecer en los programas de las escuelas de negocios. Cualquiera diría que la Epistemología es aquello que se estudia en un curso de doctorado pero sobre lo que nunca más se vuelve a pensar. Sin embargo yo llevo un par de años en que para mí se ha convertido en un elemento clave de mis reflexiones y de mis paseos en bicicleta por los maizales y praderas de Wisconsin. Clave no sólo con respecto a todo lo mucho o poco que he aprendido en los últimos casi cuarenta años y que ahora cuestiono porque no estoy seguro de cuánto de lo que he aprendido es verdadero, cuánto es una construcción social y cuánto es simplemente falso. En Octubre de 2005 tuve la oportunidad de escuchar en Camden, Maine a Nassim Nicholas Taleb. Entonces uno de sus libros (“Fooled by Randomness: The Hidden Role of Chance in Life and in the Markets”) me ayudó a entender porque muchas veces aquellos que nos dedicamos a la gestión empresarial (“management”) estamos más equivocados de lo que nos creemos. Generamos explicaciones racionales y plausibles para acontecimientos que ya han sucedido, independientemente de lo absurdo e imposible que fueran “antes de suceder”. Recientemente Taleb ha publicado otro libro (“The Black Swan: The Impact of the Highly Improbable”) que es una versión más refinada y elaborada pero con las mismas ideas básicas que su anterior libro. Mucha gente lo critica, a lo mejor con razón, pero para mí no hay duda de que hay algunas buenas ideas (además de esa que habla acerca de acontecimientos raros e inexperados que pueden tener un efecto brutal en nuestras vidas, nuestros negocios, etc.). Una de esas ideas es la que hace referencia a como estamos “diseñados” biologicamente para buscar la confirmación de nuestras ideas y pensamientos. Lo bueno del libro, desde mi punto de vista, es que aproxima a todos aquellos de nosotros que no somos intelectuales a las ideas de Popper, Hayek, Poundstone, Samuelson, Poincare y otros pero desde lo cotidiano, no desde lo puramente filosófico . Yo tuve la gran oportunidad no sólo de ver y escuchar a Popper en el Palau de la Generalitat de Barcelona sino de que el Profesor Eduard Bonet me introdujera a sus ideas y a las de todos aquellos que han hecho aportaciones relevantes a la filosofía de la ciencia y al conocimiento en general. Han pasado más de quince años pero todavía pienso en esos temas e intento que mi trabajo y mi vida cotidiana este marcada por ellos y no por los prejuicios ni las construcciones sociales (aunque es más fácil decirlo que hacerlo). Hace ya unas semanas, del 18 al 22 de Octubre, tuve de nuevo la oportunidad y el lujo de asistir a Pop!Tech, una conferencia similar aTED pero que se celebra en la otra parte del país, en la costa Este, concretamente en Camden, una pequeña localidad costera del maravilloso estado de Maine. Este ha sido mi tercer año consecutivo asistiendo a Pop!Tech y por lo tanto, aparte del tema y de los ponentes, tengo la oportunidad de encontrarme de nuevo con muchos de los asistentes, que repiten igual que yo, y podemos ponernos al día de lo que ha ido sucediendo durante el año. El primer día, entre otros ponentes, me impresionó Will Wright, que es la mente detrás de los famosos juegos de ordenador de la serieSims (SimEarth, SimCity, SimAnt, SimCopter, The Sims, etc.). Wright señaló que los famosos Juegos de la Vida de John Conway cambiaron su forma de pensar de forma radical. “Despues de haberlos visto, nunca confiaras en tu intuición de nuevo”. De estos juegos es importante destacar el hecho de que de unas sencillas y simples reglas, se originan resultados complejos sorprendentes, difíciles de comprender para los humanos. Wright mencionó que estos juegos son un increíble ejemplo de comprensión de como unos pocos bytes para reglas y patrones de comportamiento desembocan en increíbles y complejas simulaciones y animaciones. El mostró algunos ejemplos muy interesantes (recomiendo a los lectores hacer una busqueda en Google y ver algunos programas disponibles que permiten recrear estas simulaciones). Lo que más me llamó la atención es que indicó que nosotros somos hijos de la producción industrial en masa y que por tanto, estamos acostumbrados a tener objetos estándares, desde nuestros típicos pisos, coches hasta incluso la televisión o el cine que vemos (alguien hace una película y nosotros la vemos sin más y de forma pasiva). Cuando eramos niños, comentó, todos eramos creadores y nuestro espíritu diseñador todavía estaba vivo. Con la educación que recibimos vamos matando ese espíritu creativo o diseñador, hasta eliminarlo completamente. El mencionó que si le pedimos a un niño que baile, dibuje o que cante algo dirá que sí mientras que si le pedimos lo mismo, a algún estudiante universitario, te dirá que no sabe o que no puede. “La educación de hoy es enseñarle a los niños que no pueden hacer lo que si pueden hacer” reflexionó. Por suerte, la educación tradicional no triunfa siempre y algunos de nosotros todavía buscamos forma de expresarnos que van desde el famoso “tunear” nuestro coche, real o en un juego de ordenador, pasando por la música, la escritura, el graffiti o hasta incluso las modificaciones a nuestro propio ordenador. Hasta ya tenemos mútiples accesorios (fundas de plástico, melodías, pegatinas, etc.) para personalizar (no ser estándar) nuestro teléfono móvil. Lo cierto es que donde realmente tenemos la oportunidad de dejar nuestra mente libre y crear de forma brutal es el mundo on-line. Wright mencionó en su charla que jugadores del juego The Sims han creado, y puesto a disposición del resto de jugadores, más de 100,000 objetos de mobiliario diferentes (sillas, mesas, lámparas, sofás, accesorios de todo tipo, etc.). Entre tantas opciones hay de todo: la mayoría de las piezas son horrorosas o simplente estándares, pero hay algunas que, sin duda, son ejemplos del mejor diseño del mundo. Hay una creatividad asombrosa por parte de los usuarios, y algunos juegos dan la oportunidad para que se exprese. La tendencia en los juegos de ordenador es crear cada vez juegos más sofisticados y complejos, con más programadores, más guionistas, más diseñadores gráficos, etc. Wright dijo que Sim City fue creado por cuatro personas, tres dedicadas a la programación y una al contenido. Ahora los juegos necesitan equipos de más de cien personas, la mitad dedicada al contenido. Hizo una extrapolación logaritmica en la que, según él, en el 2050 se necesitarían mas de dos millones de personas para realizar un juego con un coste superior a los 500 millones de dólares. Obviamente, es hora de buscar mejores formas de diseñar los juegos. Lo mejor, lo más barato, y lo más innovador es involucrar a los jugadores en el proceso. Para llevar a cabo este proceso hay que entender bien el rol de los modelos dentro de los juegos. Hasta ahora, la realidad de nuestros juegos se basa en modelos que parten de ecuaciones matemáticas más o menos sofisticadas. Por ejemplo, en Sim City, el crimen es igual a la densidad de población al cuadrado menos el valor de la tierra, menos el efecto de la policia. Básicamente y en otras palabras: cuanta más gente más crimen; menos crimen en los barrios de los ricos y menos crimen también cuando hay más policia. Los jugadores, advertía Wright, juegan creando sus propios modelos mentales basados en esas reglas pero de forma intuititva. La idea para los desarrolladores de juegos es que hay que fijarse en lo que los jugadores hacen y entonces, construir juegos basados en modelos de jugadores, buscando mejores formas de desafiar, y también recompensar, a los jugadores, basado en sus comportamientos. 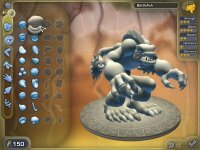 El nuevo juego de Wright, en el que lleva trabajando los últimos años, y que saldrá al mercado en el 2007, se llama Spore (los que hemos tenido la oportunidad de ver las primeras demostraciones nos hemos quedado boquiabiuertos). Está basado en la idea de que los jugadores son los creadores y que son ellos los que pueden poblar universos con la creatividad que ellos mismos tienen. La idea de Wright es crear un juego en el que el jugador no es Luke Skywalker, tratando de luchar contra los miembros del Imperio del Mal, sino ser George Lucas, con el control de como se desarrolla la trama y todo el universo entero. 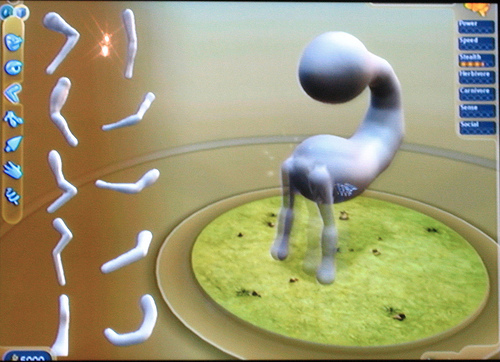 Spore tiene lugar en una especie de universo que va evolucionando desde lo más sencillo, el mundo celular, para convertirse en organismos que evolucionan física y socialmente, llegando a formar tribus, ciudades e incluso civilizaciones. Relacionado con esta especie de evolución el juego va también desde el pasado más lejano hasta el futuro más distante. Wright nos demostró esto con los editores, que son el alma del juego y que permiten a los jugadores expresar su creatividad. En unos segundos y con apenas 15 o 20 clicks de ratón creó una criatura con la forma de la letra C, con boca en la parte inferior, con los ojos en la superior, que puede caminar, saltar, gritar, etc. Una vez la criatura está acabada, siempre al gusto del jugador, la sacamos al mundo. En él se encontrará con otras criaturas, creadas por otros jugadores y enviadas al servidor central. La criatura tiene que comer, sin ser comida, encontrar pareja compatible, poner huevos, evitar que otros se los coman. Cuando los huevos eclosionan se ganan puntos que permiten evolucionar a la criatura, por ejemplo, ser más rápidos al correr, caminar a dos patas, garras más poderosas, etc. Conforme el juego avanza, estas criaturas van evolucionando y adquiriendo mayor inteligencia. Empiezan a crear grupos, despues poblados, ciudades, y todo siempre diseñado por los jugadores que van aportando sus creaciones. Llega un momento que la inteligencia avanza tanto que son capaces de crear naves que vuelan, viajando a otras partes del planeta, relacionán dose con otras criaturas que nos pueden acoger amigablemente o comernos. También pueden modificar regiones para hacer más fácil la supervivencia, poblar zonas deshabitadas, etc. Obviamente, no se queda ahí. Viajes a otros planetas son posibles, donde miles de jugadores han creado mundos que son muy diferentes, y donde no sabemos como vamos a ser recibidos, hasta que nuestras criaturas interaccionen con ellos. Podemos impresionar a una cierta civilización y ser recibidos como dioses, o ser atacados con láseres que son inimaginables para nosotros. Al alejarse la nave del planeta, podemos ver que ese no es más que uno de una galaxia formada por miles o millones de planetas donde miles o millones de personas reales están jugando y evolucionando sus criaturas. El juego da las herramientas para que miles de jugadores desarrollen mundos insospechados para otros miles de ellos. Gracias a este juego, estos miles de jugadores interactúan con otros jugadores que han creado infinidad de opciones y no con el pequeño grupo de éstas que unos pocos programadores y guionistas hubieran podido pensar. En cierto modo es la forma de aprender: crea, experimenta, modifica, mejora, vuelve a probar, etc. Muchas personas sobre todo de generaciones anteriores a los ordenadores manifiestan que los niños de hoy tienen un don especial con los ordenadores, con los juegos e incluso manejando un ratón o un joystick. Sinceramente creo que la razón es debida, no a un don especial, sino a un cambio de paradigma basado en la forma de aprender. Muchas generaciones, incluida la mía, se han educado en un paradigma que se basaba en el no errar, hacerlo a la primera lo mejor posible. En nuestros exámenes teníamos que aprobar a la primera si era posible, pasar el carnet de conducir a la primera, etc. Mucha gente tiene pavor o miedo a los ordenadores porque piensa que si hace algo equivocado se va a estropear o va a perder toda la información y ante ese miedo, muchas veces se retraen de actuar. Mejor no tocarlo no se vaya a estropear. ¿Es eso involución? Creo que sí, si la entendemos como la detención y retroceso de una evolución biológica, política, cultural, económica, etc. Toda la sociedad estaba basada en hacerlo lo mejor posible, lo antes posible. Sin embargo, los jovenes de hoy, tienen esa habilidad con el ratón, con el joystick, con los ordenadores porque no tienen miedo a equivocarse. Muchos de los juegos actuales requieren de múltiples intentos hasta que uno consigue poder pasar al siguiente nivel. Esos intentos proporcionan el adquirir habilidades con el ratón, coordinaciones visuales, etc. no vistas anteriormente y que a algunos le parecen asombrosas. “No tengo miedo, si me matan lo vuelvo a probar hasta que lo consiga” – parece ser el lema de los chicos de hoy. El aprendizaje en este nuevo paradigma no penaliza los errores; es a través de cometer errores como uno mejora y aprende. En la educación tradicional (y todavía en mucha de la actual) el aprendizaje penaliza los errores. Hay que hacerlo bien a la primera. En los juegos como Spore, uno evoluciona (y avanza en el mismo juego) mejorando sus criaturas, adaptándolas a su entorno, alimentándolas y multiplicándolas. Si a uno le matan a la criaturatiene en cuenta esa experiencia para que la siguiente creación no cometa los mismos errores de diseño. Se llama evolución. Este artículo se publicó también en Infonomia la semana del 11 de Diciembre de 2006.